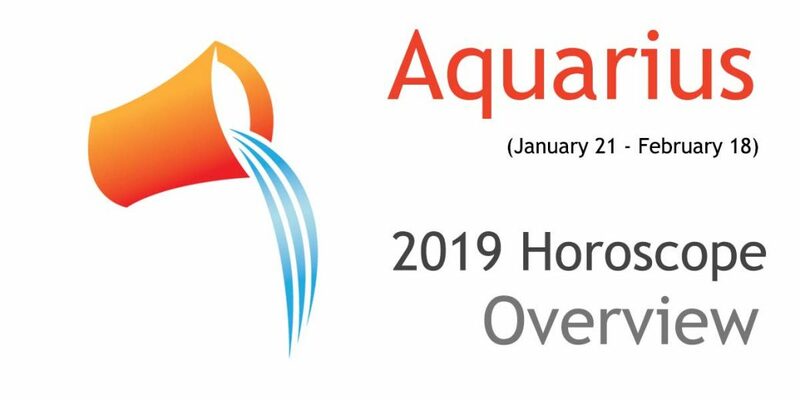 Year 2019 brings you peace and restive moments, dear Aquarius. June to August is when you are most stressed out. You may acquire a new home, vehicle, electronic devices or industrial equipments. Make provisions for sudden and unexpected repairs and the non-functioning of machines and devices. Your social scene is hot as you partake in clubs, large gatherings and political campaigns. On the health front, you may have to make several visits to hospitals, medical professionals or healers. Accidents, fractures, allergies and other skin problems may surface. Love is in the air, in form of affairs, marriages, partnerships, friendships and arrival of new members in family and social circles. You must learn to put your ego aside and let relationships flourish smoothly and easily. You’ll have the support of friends and loved ones at the time you need them most; in fact they’ll help you in achieving your dreams and hopes. For the most part you enjoy weaving a bright future and even the impossible will become possible. Money and honey are both sweet now. You could find yourself being more involved with friends or in your social circles. As a result, returns from your business or profession are likely to have a boost. There is a stroke of luck, success in ventures and joy in both marital and domestic life. For you it’s a time for social interaction, tenderness and altruism. Your loved ones also discover an artistic aspect of your personality which adds to everyone’s delight. You now learn and understand things in depth giving life a new meaning. Your long time relationship might endure some unexpected arguments. Try to stay focused on your hard work. Though harmony abounds, still your personal happiness could be constantly challenged over issues of failures/mistakes. You may be seeking isolation already and busy finding out “the right way.” You may be inclined towards spirituality and healing. There will be significant changes in your lifestyle, and that will be your real success this year. Sometimes getting liberated out of attachments, and probing and dumping unreasonable habits and practices is painful but required for further growth and maturity. Grand plans are embarked upon now and yield expected returns and even better in some cases. You even get appreciation and support from friends and foes alike. The trend that you follow now is both revolutionary and path-breaking. You are on a high, in terms of health and energy and work tirelessly for digging up stunning results. Channeling your wisdom in the right direction and your resources in the way can lead to immense success and satisfaction. You are now able to achieve true potential by means of introspection and contemplation. Your instincts bring you closer to your significant other and you now feel totally in sync. You project an aura of satisfaction and happiness. Getting through a personal burden will inspire you to keep only those things/people that you truly need. Health issues as a result of over thinking and depression may come up, but will disappear themselves by the end of the year. You may be inclined towards more unconventional jobs and work even at odd hours. You may tend to overrule and ignore society and make your own rules. Some of you may feel crushed and drained by failures. Adversity has the effect of revealing hidden talents so face them with courage. There are many lies, frauds and refusals that you now come across. But remember, NO just means NEXT OPPORTUNITY, so spread out and grow! Please can you tell me if any one from my pass will ever return into my life again as i am finding it hard to move on. Do not dwell on the past it only makes you a bitter person..
Do not forget who you are or you can end up loosing yourself and realizing when it is too late.. I have just been through a bad break up and sat back and really thought about why i need this person,try doing that and then ask yourself about the pros and cons..
Hope that helps you move on..
since mid 2008 life has never been good for me.last year i was dismissed from job.will i ever be able to start my own business,what kind of business can give me hope and success? a) Affirmations – After every few hours repeat to yourself that “You are truly loved”. b) Join some health program or personality development program. Start pursuing your hobbies. c) Prayers, meditations, yoga, pranayama etc. will also help. month starting from july has been horrible and still i m glad that i am alive.i am haunted by these disturbing thoughts and i am relly afraid what if it happened help me!!!!!!!!!!!!!!!!!!!! when my fanancial problem will be solved.born on 11.02.74-1:20am mauritius. i m very confused about my future. i am fond of music & acting. i also want to direct some movies.but my family conditions are a big problem for going towards this line.. sometimes i want to make big money on one hand & make powerful carier like I.A.S. or manager of a big company on another hand….. where should i go?????? i born on 30-01-1988 at 5.45 am. I must say that the end of 2009 and the beginning of 2010 was the worst time or year ever for me! Everything went wrong, from little things to paper cuts and bruises to big things like getting fired from my job. I really have a bad feeling about this year. Any advices or predictions? 2009 was the worst possible Year I ever had. Whatever I did was against me. I lost my wife house and I can be happy to be still alive. I wonder if those people do this on purpose to us. Aquarius is the sign of Genius hated and loathed by most. What have I done to deserve this? I tried to make the world a better place. Anyone that wants to have a look at my Invention that nearly costs my life feel free. As for the predictions, take them with a pinch of salt. Well supposedly 2009 was a Jupiter influenced standout lucky year for us Aquas. Wrong on so many levels. Probably one of the dullest on record punctuated by the sound of doors slamming in my face, no matter how hard I tried. I can’t really think of one success. I basically trod water. So if that was the best for 12 years I dread to think!!! At least it fired me up for this one. I think Saturn is leaving…please…just go!!! give me more of what is going to happen to me please ?